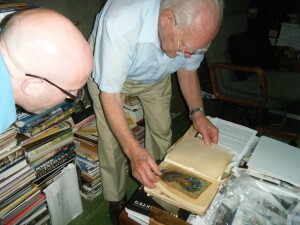 This week, Manager of Collections and Registration Martin Mahoney and I had the privilege of visiting with veteran illustrator Ed Vebell, whose extraordinary career as a combat, editorial, and historical illustrator has spanned seven decades. 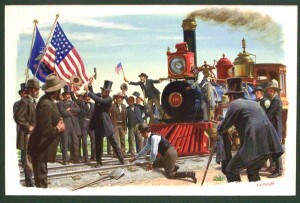 We are fortunate to feature one of Ed’s original illustrations in the Norman Rockwell Museum’s permanent collection, a generous gift of the artist depicting the dramatic nineteenth century meeting of the East and West Railroads at Promontory Point, Utah. Fortunately, we captured our conversation with this gifted visual communicator on video for the Museum’s growing collection of oral histories, which can be referenced through the Norman Rockwell Museum Archive. "Driving in the Golden Spike," Ed Vebell. All rights reserved. From the permanent collection of Norman Rockwell Museum, gift of Ed Vebell. parents. At the age of fourteen, he began attending art school, where he excelled as a draftsman. 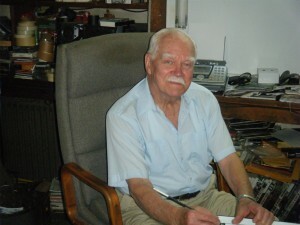 After launching his professional illustration career in a busy Chicago agency, he enlisted in World War II, and began his tenure in the United States Army in a camoflouge company. It was not long he was recruited to create imagery for The Stars and Stripes, a military publication that had featured Norman Rockwell’s drawings during World War I, as well as Yank Magazine. Josephine Baker, Edith Piaf, Andy Rooney, and Bill Mauldin were among the famous individuals he became acquainted with while working on assignment. In 1945, he participated in the Nuremberg War Crimes Trial as a courtroom artist, capturing the brooding likenesses of Goering, Hess, Speer, and Ribbentrop, which are now among the collections of the Museum of the Holocaust in Washington, D.C.
An Olympic fencer and World Champion, Ed married an accomplished practitioner of the sport, and moved to Wesport, Connecticut, an active community of celebrated illustrators during America’s mid-century. No stranger to hard work, he spent seven days a week in the studio to satisfy ongoing deadlines, creating paintings and drawings for mass circulation magazines like Readers Digest, Time, Sports Illustrated and Sports Afield. An accomplished photographer as well, the artist also arranged photo shoots for famous Western artists, making the many authentic costumes and props that he has acquired over a lifetime available for their use. We look forward to exhibiting and preserving his Ed Vebell’s Promontory Point for many generations to come.